I hope that everyone had a very Happy Thanksgiving! If you are heading out to do some shopping this weekend remember to include a stop at your local scrapbook/stamping store or venture out to find one you didn’t know existed. Tomorrow is Small Business Saturday, a yearly initiative by American Express to help bring customers into small local businesses and keep them in business. This week it’s my pleasure to be able to introduce you all to Sheryl from The Woodlands (in my favorite state, Texas) and share some of her terrific cards. Sheryl’s life keep her too busy to blog so I hope you will all take a moment to say hello and leave her a comment here at the end of this post. How long have you been stamping? I have been stamping for over 11 yrs. My best friend, Carol, introduced me to stamping several years before that. I thought it was fun, but thought she was a little out there, saving scraps of paper, and having all these inks, and stamps and on and on. So decided to not pursue this hobby that looked addictive. A few years later, I needed something to do with my 90 year old grandmother. The family was putting on a birthday party for her, and I thought it would be neat if she and I made thank you cards for hr to send out after the party. My husband also thought it was a good idea, but asked, you aren’t going to get like Carol, are you? And, sincerely, I responded, NO WAY. Well, it was downhill from there! The thank you cards cost over $200 and that, as you stampers know, was just a drop in the bucket!! Carol and I still laugh about how I’m probably more addicted than she. What are your favorite stamp/craft products? My favorite line of stamps, if I could only pick one, would be Hero Arts. However, I have stamps from almost every line; and love them all. Do you have a favorite technique? That is my problem – I love diversity and detail so am always doing something different. If I were allowed to do only 1 technique, it would be watercolor. Are there colors you love to include on your cards? 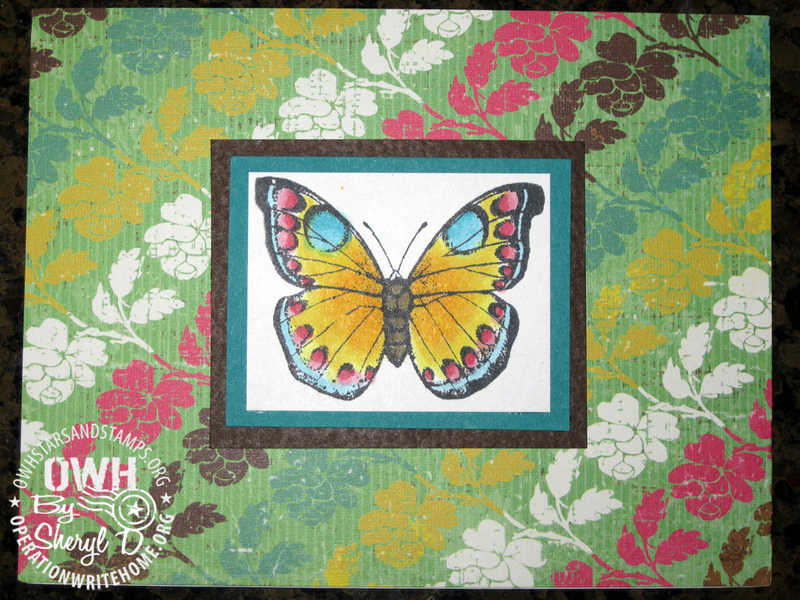 In the last year, I love to use combinations of lime green, orange, aqua blue and purples. It makes me feel good to see the bright cheery colors! How did you hear about Operation Write Home? I think it was late 2007 or early 2008, I had heard somewhere about an organization that made cards for the soldiers to send home. So I searched the web and found OWH, of course, back then, it had a different name, and I did a bunch of cross checks to make sure it was a legitimate organization. I had stacks of cards that I had made, as I had a need to make cards when I wasn’t working but couldn’t use them all. So was delighted to find OWH! What motivates you to make cards for our heroes? I just think about how happy the heroes must be to know that someone cares enough to make them cards to send home. And then I can visualize a little son or daughter, or a mom or dad, a sweetheart, or a friend or relative getting the card and smiling when they open it. It also gives be an excuse to buy more stamps and inks to make cards that I would never get to make. It has been a blessing to me to be a part of this project!! Great cards, Sheryl! I love them all, but the little chickadees especially made me smile! Cute cards, but I especially like how you made the little chickadees out of buttons. Very creative idea! These are all such nice cards Sheryl. The Chickadees are sweet and the way you did the Snowman on the labels is just so creative! I think many in the OWH family would agree that being able to make cards for such a great cause is a blessing to each of us. Thanks for letting me share your cards with everyone this week. 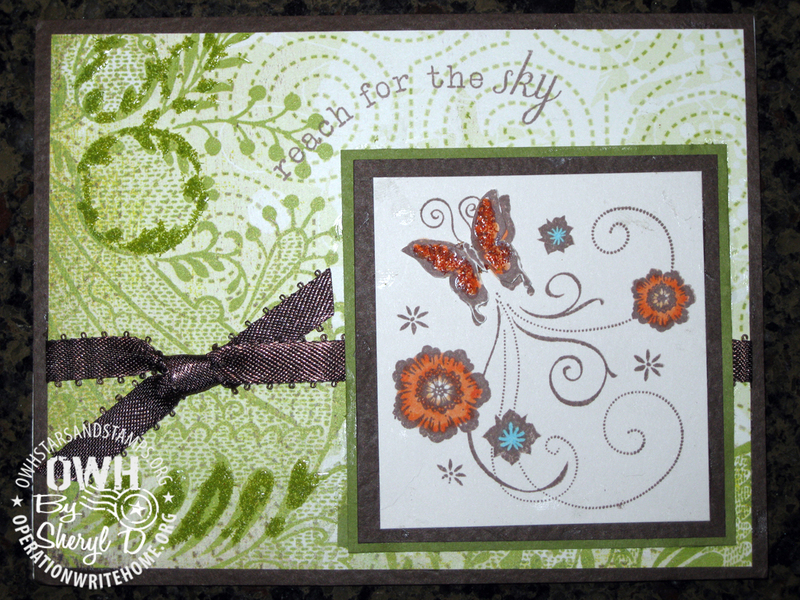 Thanks for sharing your beautiful cards, Sheryl! I especially love your stunning monochromatic snowflake card! I laughed out loud at the story of how you caved into the "addiction"!! Sheryl,I love your story! They are all great, but I especially love the snowman and your snowflake card. Thank you for sharing your beautiful cards! Sheryl, Your story made me laugh because I think that is the same story for all of us. The first imte I saw my friends studio which ran over into her dinning room, I said, she nuts. Well I guess I'm just as nuts if not more. Anyway you make beautiful cards. You have a very diverse pallett, which is a very good thing. Thanks so much for sharing with us. 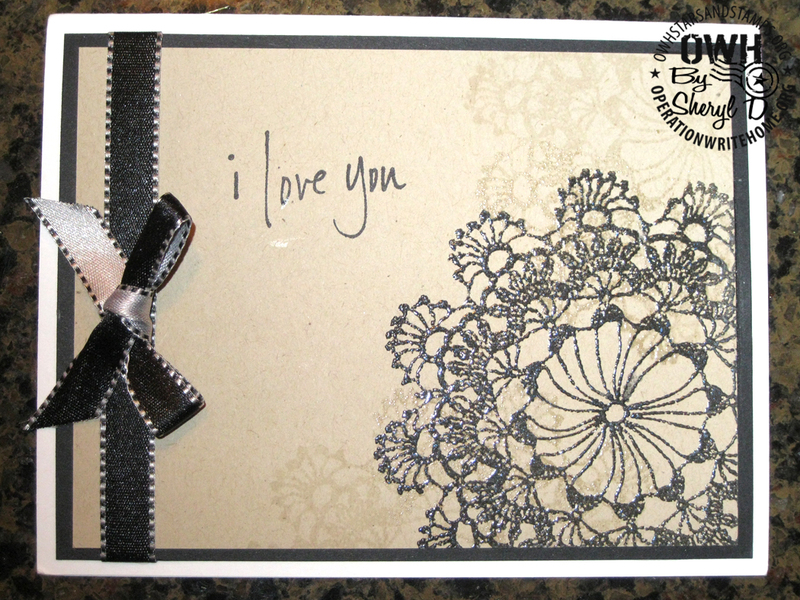 The I Love You card is very elegant.Your story really made me smile. Your cards are very beautiful, and I also loved the story of the $200. thank you cards…. I can relate!pat K.
Great cards…I especially love the 'i love you' doily card…and love the story of how you became an addict! Each card is so pretty! I love the story of you and your friend. Wonderful story and wonderful cards! Love the chickadees…I am partial to buttons! Thank you for sharing your wonderful cards, Sheryl. 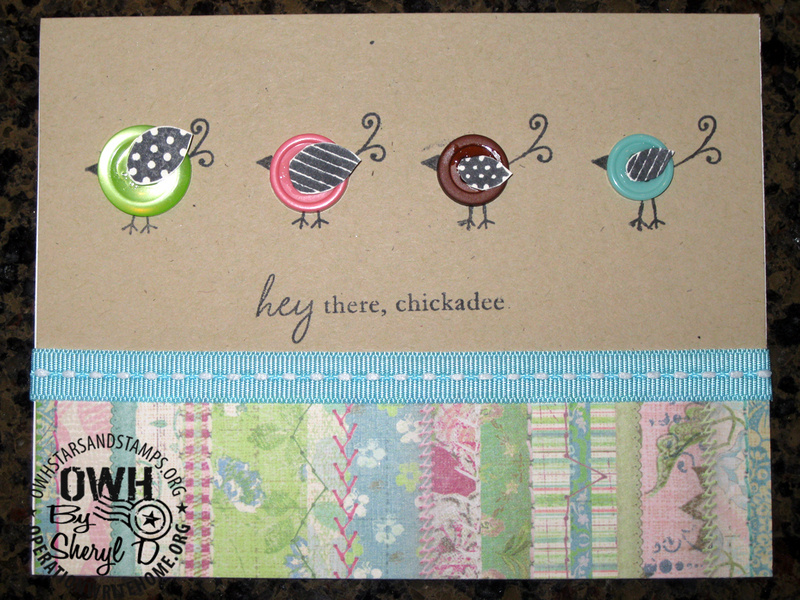 Your chick-a-dees made me giggle – I'm a lover of buttons and whimsy, and this card is just so much fun!